This is a really simple, no stamping card! I used a Basic Black cardstock base with a layer of Blooms & Bliss Designer Series Paper (DSP) & then I've cut out the Sunshine Wishes Framelits (these also come in a Bundle) using some more of the designs in the Blooms & Bliss DSP. This has got to be one of my favourite sets of DSP, its full of beautiful designs in all my favourite colours. Add some Washi Tape & Enamel Shapes & you're done! I have entered this card into the Crazy Crafters Project Highlights. You can see all the entries & vote for your favourites from 7.30pm tonight! 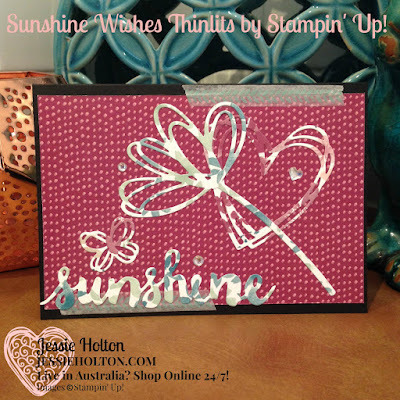 I have also entered this card into the Just Add Ink challenge for this week.